Cardholder Training can be obtained in-person or online for cardholders. In-person Cardholder Training is required for reallocators. Training must be completed prior to picking up the Purchasing Card. Cards need to be picked up within 30 days of the arrival email notification. Only Cardholders are allowed to pick-up their Purchasing Card. Retraining may be required if an application is not submitted within 6 months of initial PCard Training. 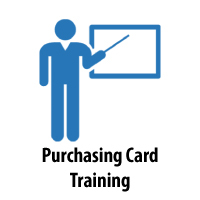 In-person Purchasing Card training is held every month on the second Thursday at 9:00 am and on the fourth Tuesday at 2:00 pm. Training takes place in the Purchasing Department located in the Park Building 201 S Presidents Circle, Room 170. Training is approximately one hour. Reallocators are required to attend in-person Cardholder and Reallocator Trainings. Reallocator training is held immediately after Cardholder Training in the Purchasing Department. Training is approximately 45 minutes. Quick Reference Guide – this is a one page document that provides the basics of the Reallocation System. Online training is available for Cardholders who will not be reallocators. You are required to pass the quiz with 80% or above. If you attempt the quiz twice and receive below 80% on both attempts, you will be required to attend in-person Cardholder Training. The PCard Handbook is available for you during the quiz. Please reference the handbook if you have questions. Account Executives are to complete the form at the link above in order to certify their understanding of their responsibilities.